Last week we had our annual license compliance summit at Synopsys corporate headquarters in Mountain View, CA. I wanted to share some highlights and summarize how things went. 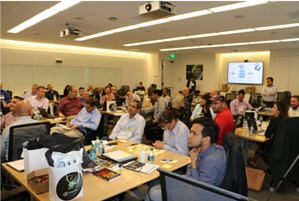 This year we had our biggest and most well-attended event with over 60 people from 24 companies and three continents. Attendees included existing customers, prospective customers, legal experts, cyber-security experts, and seasoned authorities on license compliance from industry-leading, global high-tech companies. The summit, in addition to a two-day training class and one-day user group meeting, included two days of speakers on cyber security, legal issues, and license compliance and two in-depth interactive workshops that resulted in some good ideas for future product development and enhancements. SmartFlow speakers included Graham Kill, chairman, Bill Griffin, advisor, and me. The sessions were recorded, so you can look forward to videos, white papers, and blogs sharing the wisdom of the speaker presentations. In the user group meeting SmartFlow CTO Chris Luijten, VP of Engineering Adrian Allen, and Customer Success Manager Adam Noonan shared all of the updates and enhancements to our portal and software development kit (SDK). This was really well received, and we are extremely proud of all the work that has gone into the product and the outstanding new capabilities and efficiencies that are available with the upcoming 2019 release. The summit also provided all of us here at SmartFlow with validation of the success of our hard work. Existing customers are very happy with the product and the people behind the product. Prospective new clients are increasingly positively influenced by the existing clients to move to SmartFlow. One of the speakers, who recently retired from a major European 3D design and engineering software company, expressed regret for not moving to SmartFlow before his retirement. He saw the product in 2015 and was amazed at how much progress has been made over the last few years. He said he will be recommending SmartFlow to his successor. Several other attendees were so impressed with our product that we expect them as well to be coming on board in the coming months. A new SmartFlow customer said, "It was great meeting everyone in person. I’m looking forward to a great partnership. The conference was great. Highlight of my year." Stay tuned for a wealth of information from the summit that we will be sharing over the coming months in the form of blogs, white papers, videos, and more. Be sure to sign up for our newsletter, which will alert you to new content available for download and/or viewing on our website. 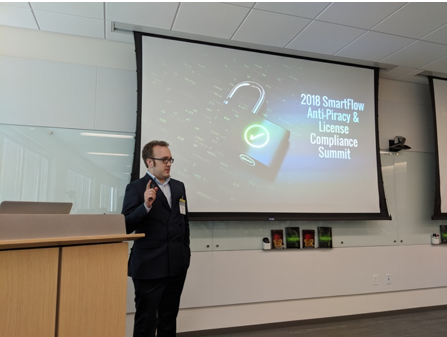 If you are not yet a SmartFlow customer and would like a complimentary compliance analysis to discover how piracy is impacting your company, your customers, and your profits, click here. I’m pleased to announce that National Instruments will be hosting next year’s summit October 7-11 in Austin, Texas. For more information and to get on the list for an invitation, click here.